Time loops in a cycle without regard to a beginning or end. The cycle loops in time, in order to complete one full rotation, perhaps forever. The rotation dreams of being an eclipse, but no matter how it is stretched will always be a circle or ellipsis. This cyclical time is archaic in origin, yet is eternal. To live in a constant state of déjà vu is best left up to the imagination and to the philosophers of time and space. As I try to channel my inner Einstein, it becomes clear that time and space is a complex subject matter for an exhibition. Even the way one is taught how to write an essay is linear, not cyclical. Without a linear thesis, this essay might loop to an unknown territory void of a fixed point and seem more like the writings of Italo Calvino. What binds the print-based projects of the exhibition Cyclic are the modes of collaboration with respect to investigations and abstractions of time and space and the dichotomy of static and fixed movements. The definition of the exhibition title, Cyclic, is intentionally open ended, allowing for four modes of collaborative printmaking to occur. The genesis of this exhibition began with NAPOLEON member, Alexis Nutini. Nutini seeks to help young emerging artists exhibit their work, with a future goal of opening a collaborative print space in his studio in South Philadelphia. Nutini’s passion for collaboration prompted his invitation of three recent undergraduates from Tyler School of Art, Bonnie Kissinger, Mike Gamble, and Sean Goldinger, to create cooperative print pieces. Together, each artist developed different modes of collaboration to create four projects with the intent to challenge their own artistic practices. Each project focuses on the following: direct, chance/play, correspondence, and response, as modes of production and shared creativity. Collaboration happens both in indirect and direct ways within shared studio spaces, like at university or a print-based nonprofit, but each space functions differently. Though the end result of a final printed state or edition may not be shared, the atmosphere of the making process is often collaborative. 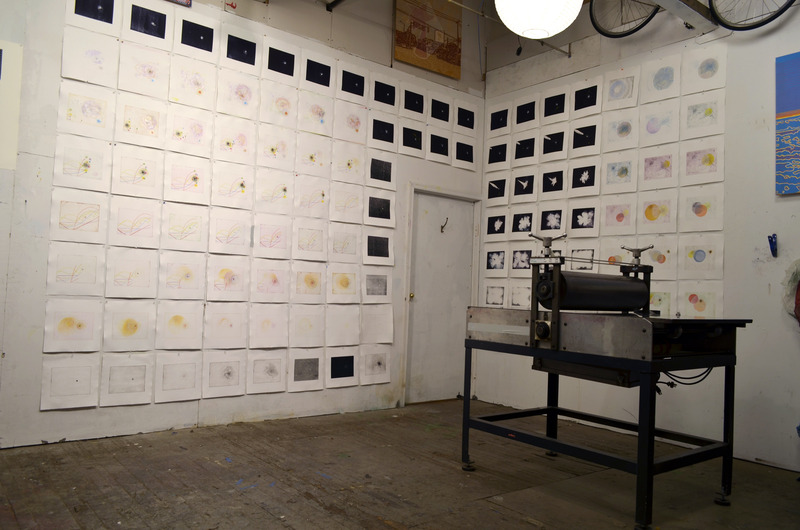 Unlike some mediums, where the artist is alone in their studio, community engagement and the endless possibilities of variables is at the heart of what draws many to the printmaking environment. The first project, Cognates, is a woodcut and offset print with painting. The artists Mike Gamble and Alexis Nutini used a direct mode of collaboration where each shared in the decision-making process for the image and in the labor of printing. With Gamble’s intricate wood engraved falling figure, combined with Nutini’s colorful pixilated landscape, they bridge their two styles of printing together seamlessly. The figure is the only moment in the exhibition that gravitates towards representation and mediates a moment within the piece that is both caught in a continuous fall and in limbo. Chance and play inform the second project, Kinesis, between Sean Goldinger and Alexis Nutini. The initial starting point for each artist was two copper etching plates per person. Every plate had a fixed point etched into the same location. This fixed point acts as an internal registration mark, which is helpful for when the prints are then edited into a stop-motion animation. Both Goldinger and Nutini made 100 intaglio monoprints and mixed media prints each, with 200 total prints for the final video. The parameters are the same, but the printing happened independently and over a course of time. Only in the completed film format do the variables of the intaglio monoprints cycle through time. The film, Kinesis, uses printmaking as a starting point. However, it isn’t until the final loop of all 200 that the audience is able to understand its relation to movement, time and space. A print correspondence between Bonnie Kissinger and Alexis Nutini involved sending prints back and forth to each other. The key element of the third print project, Proxemic, is the role of non-verbal communication. Their only communication during the printing process was through the initial objects that they exchanged to start the image making and visual conversation. After the first marks were printed, each would respond to their layers in their respective studio spaces. The final presentation of all of the prints was then reconstructed to interact on the wall of the exhibition. This created a printed lattice of their variable editions and the cohesion between their pieces. The final project, Satellite, occurs between Kissinger, Gamble, and Goldinger and uses a responsive mode of collaboration to create a final object of a wooden cube with six prints total. 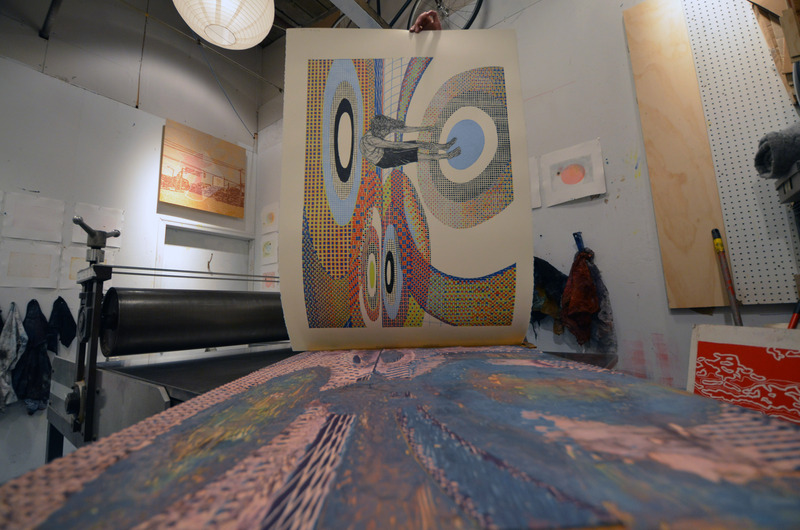 The process began with each artist having two sides of the cube and printing the initial layer. Two layers were then added to each side of the cube for a total of three layers on each side. Satellite functions as a physical and artificial object that orbits above and as a metaphorical entity in the context of the three projects. However, unlike a satellite intentionally placed into outer space, this object must contend with gravity. Therefore, the cube is suspended in the exhibition space and acts as a physical fixed point within the space. In summary, the exhibition Cyclic is an exploration of a collaborative print practice that challenges the presentation of printed ephemera into objects and exchanges. The projects bridge the themes of cyclical time verses linear time, celestial space and corporeal space and activates the exhibition space with how we see and experience these objects. What is at stake by having a collaborative art practice is that there must be sacrifices that each artist must make to come to a consensus for a project. Compromise, flexibility and communication are necessary for a project to commence and an acceptance of the unexpected to occur. By having a project-based initiative there are parameters that set up guidelines for each artist. Through each mode of collaboration, there was leadership and curation by Alexis Nutini, but a shared vision and consensus by all artists. The projects Cognates, Kinesis, Proxemic and Satellite delve into the themes of time and space in ways that allow each artist to continue to create new modes of collaboration. Dominique Ellis is a visual artist and researcher. She received a M.F.A. 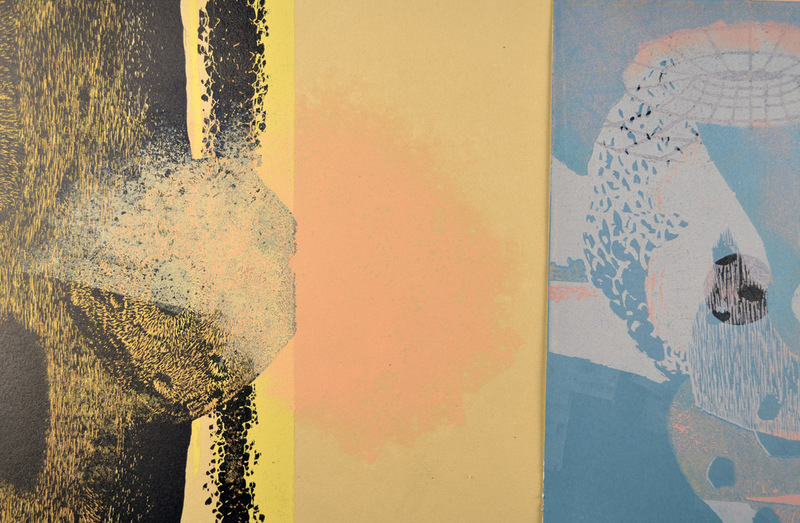 in Printmaking from Tyler School of Art, in 2013. She was awarded a U.S. Fulbright student scholarship for Egypt, as well as an Arabic language grant for 2009-2010 and was based in Cairo, Egypt. She served as a U.S. Peace Corps volunteer in Morocco, from 2006-2008, working for the Moroccan Ministry of Handicrafts. Ellis works as a gallery assistant at The Clay Studio where she is currently creating new ceramic work and new print work at Second State Press in Philadelphia.